what is inside thandai ? Can there be a Tom without a Jerry, a Betaal without a Vikram, or a picnic without Antakshari? Now imagine a Holi without Thandai. Unthinkable, no? If you've ever looked for the literal embodiment of the word "chill", Thandai. Is. It. This ancient pick-me-up is touted to be Lord Shiva's favourite and features quite regularly in Hindu mythology, all hail its super-cooling effects. Sure, Thandai had its humble beginnings in the oldest by-lanes of Lucknow and Varanasi, but it is perhaps the first ever phenomenon to have gone viral. Yup, this drink caught on faster than Gangnam Style. Thandai is so cool, that if it were a student, it would be the super-popular backbencher. The one to get stars on their homework, win gold medals on Sports Day, all while casually rocking Talent Day. It is the drink that all other drinks hope to one day become. And rightfully so. This Holi, chug a few glasses before bounding off with them pichkaaris, because Paper Boat Thandai spares no generosity. Lush and rich and made the traditional way, our Thandai is milk suffused with cardamom, fennel, and black pepper, and loaded with almonds, melon seeds, and khus khus. With so much stuffed inside, you won’t just drink Thandai. You’ll eat it too. If you can't find a jetpack, get yourself Paper Boat Thandai. It's an instant energy booster, and its melon seeds are full of protein, iron, and vitamins. With all those almonds in there, Thandai is also rich in antioxidants and Vitamin E. Fennel, pepper, and cardamom are known for their special digestive properties, so you don’t have to think twice before gorging on gujiyas and malpuas. Don't run away just yet, there's more! The calcium in the milk keeps your teeth, bones, and muscles strong. And while this drinkable fridge cools your body and mind, rest assured knowing that it's also powering up your immune system. So there you have it. Now go hurl those water balloons, dunk your friends in water tanks, and lose yourself in all the madness and melee of Holi. 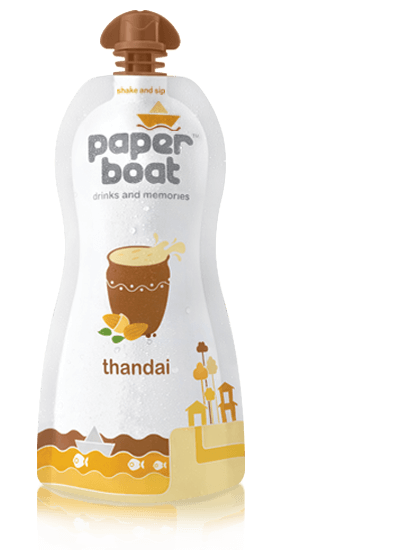 Paper Boat Thandai's got you covered.